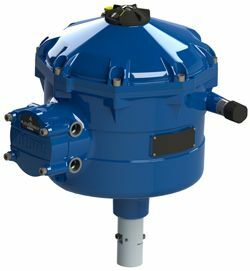 Rotork’s innovative CVA electric control valve actuator technology has successfully delivered an improvement in performance with reduced operating costs for the vital gas blending process on a European natural gas distribution network. 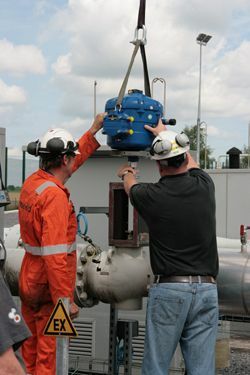 Engineers from Fluxys, Rotork and Mokveld removed the existing actuator, fitted an ATEX certified explosionproof CVL-5000, re-connected the control signal and carried out a series of tests that demonstrated improved response times, accurate valve positioning, low running costs and fail-to-position operation on loss of mains supply. 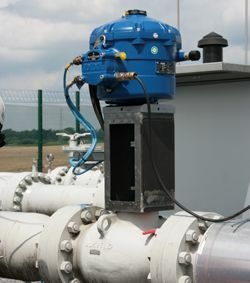 Fluxys has decided to adopt the CVL-5000 as the standard actuator for its gas blending plants; over time, existing valves will be retrofitted whilst new valves will have the actuators factory fitted. It is estimated that the improved performance achieved by each valve installation can be accompanied by an annual saving of up to 5000 euros in operating costs per unit. The Rotork CVL linear electric process control actuator offers a highly accurate and responsive method of automating control valves, without the complexity and cost of a pneumatic supply. With resolution figures better than 0.1% and the ability to eliminate position overshoot, the CVL helps to maximise product quality and plant capacity. The CVL is built in a range of sizes suitable for almost all linear control valve applications requiring very accurate positioning. It offers end users high standards in performance, build quality and overall value. Standard features include continuous unrestricted modulation duty (S9); single-phase or DC power supplies; on-board datalogger; non-intrusive set-up, control and diagnostics; watertight IP68 and explosionproof enclosures; digital communication choices including HART and Profibus; configurable fail-to-position ability using supercapacitor technology.